Steady gains have led to more visitors, more exports and helped Utah weather the recession. Tribune file photo The Outdoor Retailer Summer Market at the Calvin L. Rampton Salt Palace Convention Center is among the growing Tribune file photo The Outdoor Retailer Summer Market at the Calvin L. Rampton Salt Palace Convention Center is among the growing Tribune file photo The Dakota Inn Lodge & Golden Door Spa, the first Waldorf Astoria property in Utah, opened in Park City in Tribune file photo The Dakota Inn Lodge & Golden Door Spa, the first Waldorf Astoria property in Utah, opened in Park City in Tribune file photo A funicular shuttles visitors to St. Regis Hotel, a luxury lodge drawn to Deer Valley since Utah hosted the 200 Tribune file photo Several ski lifts sit outside Deer Valley's Montage hotel, which opened in December 2010. 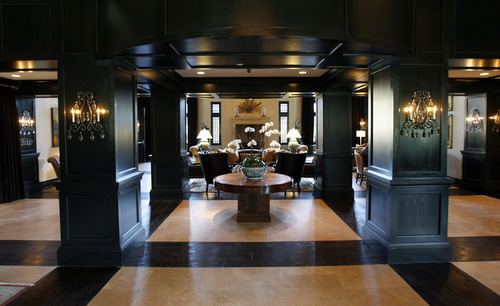 Several luxury lodges Tribune file photo The number of skiers and snowboarders visiting Utah resorts increased by 42% since the 2002 Winter Olympics Tribune file photo The number of skiers and snowboarders visiting Utah resorts increased by 42% since the 2002 Winter Olympics. 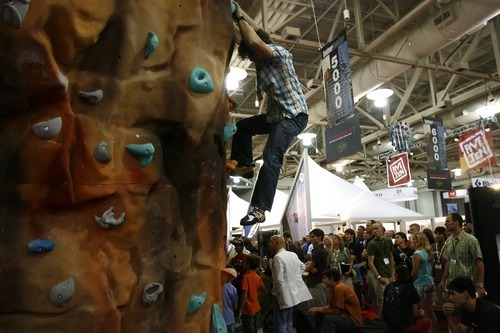 Tribune file photo The Outdoor Retailer Summer Market at the Calvin L. Rampton Salt Palace Convention Center is among the growing number of conventions that have come to Utah. 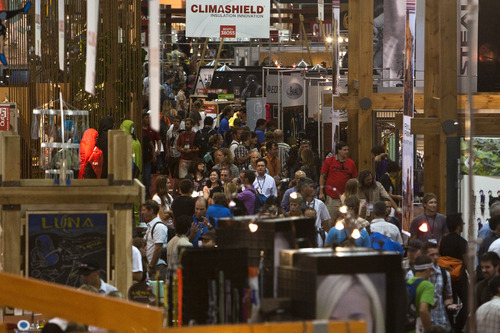 Tribune file photo The Outdoor Retailer Summer Market at the Calvin L. Rampton Salt Palace Convention Center is among the growing number of conventions that have come to Utah. 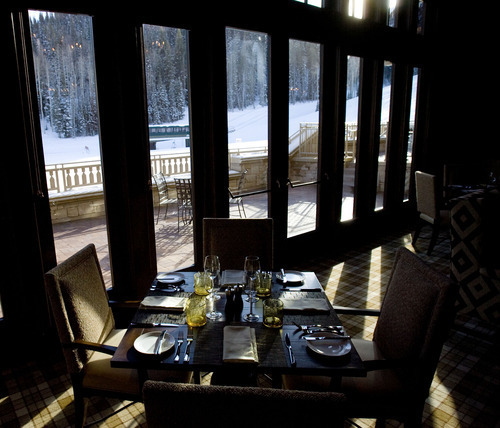 Tribune file photo The Dakota Inn Lodge & Golden Door Spa, the first Waldorf Astoria property in Utah, opened in Park City in 2009. Tribune file photo The Dakota Inn Lodge & Golden Door Spa, the first Waldorf Astoria property in Utah, opened in Park City in 2009 Tribune file photo A funicular shuttles visitors to St. Regis Hotel, a luxury lodge drawn to Deer Valley since Utah hosted the 2002 Olympics. 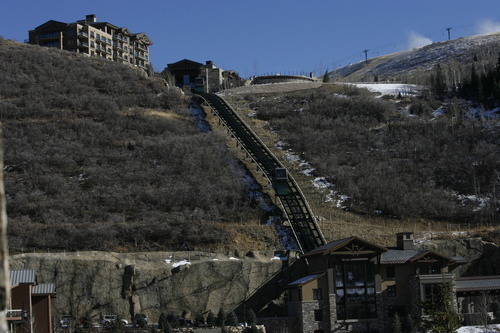 Tribune file photo Several ski lifts sit outside Deer Valley's Montage hotel, which opened in December 2010. Several luxury lodges located in the Park City area after the 2002 Winter Games with Utah enjoying a 42 percent jump in skier visits since the Olympics. 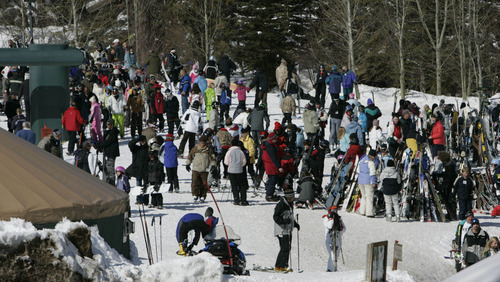 Tribune file photo The number of skiers and snowboarders visiting Utah resorts increased by 42% since the 2002 Winter Olympics Tribune file photo The number of skiers and snowboarders visiting Utah resorts increased by 42% since the 2002 Winter Olympics. As big as they were, the 2002 Winter Games did not alter Utah's economic landscape. Ideas that they would were as overblown as the notion that locals would make a killing renting their houses to visitors during the Olympics. Those things just didn't happen. What occurred instead was more incremental, with gains derived steadily as positive media exposure enhanced Utah's visibility around the world and infrastructure developments accelerated by the Olympics were put to use. "We were a global state before the Olympics, but internally we discounted who we were as Utahns," said Spencer Eccles Jr., executive director of the Governor's Office of Economic Development. "Having the Olympics here awakened the world to Utah, but also Utah to the world. Now we know we are a global state. We have grown into that in the past 10 years," he added. "The Olympics clearly awakened a sleeping giant." That was the goal when Salt Lake City's Olympic quest began in the 1960s. It appears to have succeeded. Current leaders of industries projected to benefit most from the Games  skiing, tourism, conventions, lodging and outdoor recreation  all can point to evidence that their business picked up enough after 2002 to help the state weather the Great Recession. "Four world-renowned hotel chains  Montage, Waldorf-Astoria, St. Regis and Aman  spent well over $1 billion during the downturn, a very difficult time," Eccles said. "That helped stave off the burn of the recession and buoyed us. Those are manifestations of a commitment and confidence that Utah is a place they want to be." At the same time, Utah companies shipped goods worth $13.6 billion to international markets in 2010, the only state to double exports over a five-year period. While the Olympics did not drive all or even much of that increase, Salt Lake Chamber President Lane Beattie said a collective self-confidence that emerged from the Games emboldened more Utahns to brave the uncertainties of global business. "The world shrunk for us," Beattie said. "We found out that these people who came in here [for the Olympics] were very similar to all of us. More people were willing to reach out and market their companies and their skills." Olympic cynic Steve Pace agreed that "the main benefits of the Olympics are psychic." But overall, he contended, the main gain from staging the Games was that "it dragged in federal money, and some stuff like light rail and I-15 happened sooner than otherwise. … In Utah, we're always on the lookout to nick every federal dollar we can get." To Eccles, the dividends of snagging federal money for freeway and transit projects were compounded by the investments made by telecommunications companies to meet the Olympics' massive information needs. "We're at the intersection of I-15 and I-80. Take that image of the highway infrastructure and overlay the infrastructure of broadband. We are at a crossroads for the telecom infrastructure," he said. "There are a number of reasons data centers want to locate here. One is the strength of our broadband sector." Having that modern infrastructure made it easier for economic-development officials to pitch Utah locations to companies in all of the state's targeted economic "clusters," Eccles added  everything from aerospace to outdoor products. The number of companies working closely with his office or the Economic Development Corp. of Utah to move or expand here has shot up. The outdoor industry has thrived, particularly around Ogden, which became a hub for winter-sports companies such as Amer Sports, Descente North America, Geigerrig, Hart Ski and Smith Optics. A European corporation, Amer Sports made Ogden the headquarters of its North American operations in 2006, four years after company officials attended the Games to tend to athletes using their Atomic or Salomon brands. "Before the Olympics, they thought of Colorado when they thought of North American skiing," said Mike Dowse, president and general manager of Amer Sports Americas. "The Olympics changed that. When the time came [to pick a North American site], they were familiar and comfortable with Utah." Almost six years later, Dowse says the selection was right. "Economically, it was a good move. And a lot of trends in skiing have started in the Rocky Mountains. It brought our production and marketing managers closer to these trends earlier," he said, resulting in big sales for Atomic. "Moving to Ogden was the rebirth of Atomic." While no lodging development has occurred yet around Snowbasin, the Olympic venue for Alpine skiing's speed races, the Ogden Valley resort has hosted high-profile Winter Dew Tour and Xterra triathlon competitions. These events show the reach of the Winter Olympics, giving the Utah Sports Commission leverage to secure all kinds of events, even summer-oriented ones. "We have the infrastructure and the expertise," said Jeff Robbins, executive director of the commission, created by the Legislature in 1999 to take advantage of the Olympics by pursuing national and international events. "We still do a lot of Olympic events, but we've broadened it to a sports legacy." Robbins said the commission has been a partner in 442 events this past decade, about 90 of which are Olympic-oriented. It also has provided $9 million to help 27 communities stage events. "These efforts," he added, "have generated approximately $1.1 billion in economic impact and an estimated $210 million in media value to the state." Still, the Games' intended beneficiaries were the biggest winners. 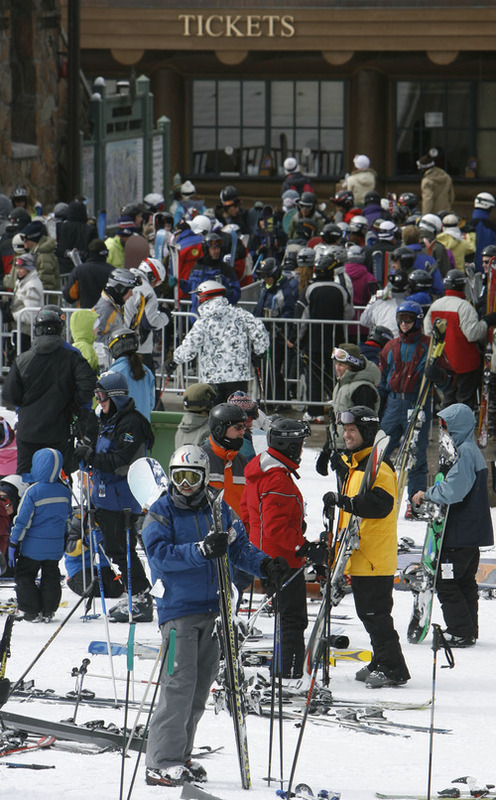 Utah's ski industry sold 42 percent more lift tickets in the winter of 2010-11 than a decade earlier. Out-of-state skiers accounted for much of that, evidenced by a 70 percent jump in their direct expenditures  from $704 million in 2002-03 to $1.2 billion last winter. "The Olympics was the catalyst," said Nathan Rafferty, CEO of Ski Utah, marketing arm for the state's 14 resorts. "Before, we were a ski product that wasn't necessarily in everybody's consideration. But the Olympics took us to that marquee level. They don't host Olympics in second-tier destinations." Neef Walker, who used to own Watson's Shelter at Alta, saw the difference when he moved back to Utah in 2005. "I'm flabbergasted at the growth in the ski industry," he said. "Colorado still has more and bigger areas, and therefore more skiers. But they certainly don't overwhelm Utah anymore reputation-wise." Park City's post-Olympic attractiveness has been enhanced by the addition of three luxury hotels bearing famous brands: Waldorf-Astoria, St. Regis and Montage. "Having sat in on the discussions with Starwood [Hotels and Resorts] about bringing a St. Regis to Deer Valley, I can assure you it would not have happened without the Olympics," said Park City advertising executive Mark Fischer. "These hotels employ lots of people and control lots of money  bringing people who only previously considered skiing in Vail or Aspen," he added. "In the minds of the world's decision makers, Utah is no longer an odd place with a strange culture, but a beautiful place where you can get a sophisticated dinner from a decorated chef while enjoying a fine wine list in a hotel among the top 10 in North America." Gains have not been confined to the Wasatch Front and Back. Utah's tourism industry grew appreciably during the past decade, boosted by bigger ad budgets to capitalize on the Games. "This has resulted in Utah becoming a great hidden secret that is very desirable to visit rather than an unknown and rather dowdy vacation spot," said Keith Griffall, CEO of Midvale-based custom tour organizer Western Leisure. The state's convention business experienced similar rewards, said Karen Boe, whose public-relations clients include Visit Salt Lake. "We had an incredible opportunity to introduce journalists from around the world to the remarkable product we have. The Games changed the conversation, put us on the radar of many new audiences," she said. "It made us realize we have a viable story to tell the world that continues to grow and evolve." Where might that lead if Utah lands the 2022 Games? $1.5 billion in earnings for Utah workers. $2.1 billion in spending directly related to the Olympics. $76 million in net revenue to state and local governments. Skier visits rose 42 percent. The number of "pillows" at Park City lodging establishments increased 33 percent. Foreign and U.S. visitors to Utah grew from 17.3 million to 20.2 million (in 2010). Conventions and meetings at the Salt Palace jumped from 39 to 68 last year. Passengers traveling through Salt Lake City International Airport soared from 18.6 million to 21 million. Venture capital funding in Utah rose to $223 million in 2011, driven by 43 deals. The Utah Olympic Legacy Foundation invested more than $120 million in sports programs and operations at Utah Olympic Oval in Kearns and Utah Olympic Park near Park City. The Utah Sports Commission has been a partner in attracting 442 events.